Kathmandu before and after the Humanitarian OpenStreetMap Team dived in. Just 48 hours after Nepal’s devastating earthquake, thousands of volunteers from around the world helped create maps that guided emergency response teams. Many of these “digital humanitarians” came from OpenStreetMap, an open source mapping effort. The Humanitarian OpenStreetMap Team (HOT) in launched 2010 after the earthquake in Haiti, when the office safeguarding country’s maps pancaked in the 7.0 temblor. 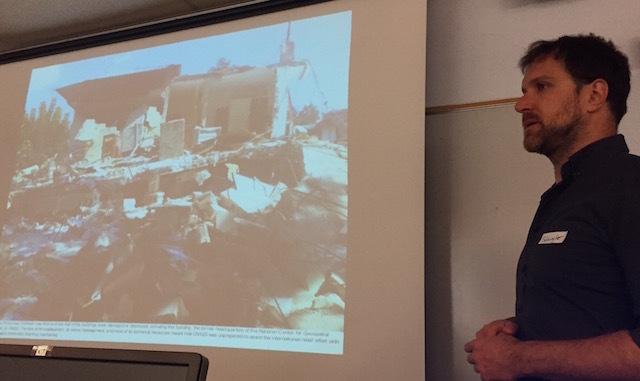 Schuyler Erle shows what happened to Haiti’s mapping office after the earthquake.